Alright, so last night was so.much.fun. 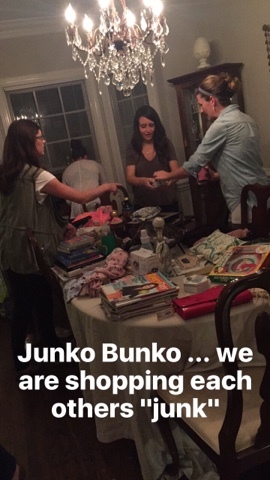 It was my turn to host our Bunko group, and we did something a little out of the norm: we had JUNKO BUNKO! I swiped the idea from a recent MOPS (Mothers of Preschoolers) meeting my friend Ashley invited me to. 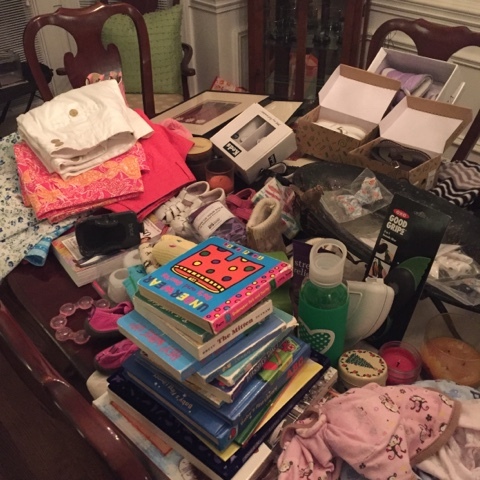 They had a swap table at the meeting where moms could offload things they no longer needed and other moms could pick items up. I just thought this concept was so cool! So, here's the invitation I came up with. I created it in about four minutes in PicMonkey. So easy. I saved the file, emailed it to myself, opened the email up on my phone and saved the image to my camera roll. Then I just group-texted our Bunko ladies and sent the image out. 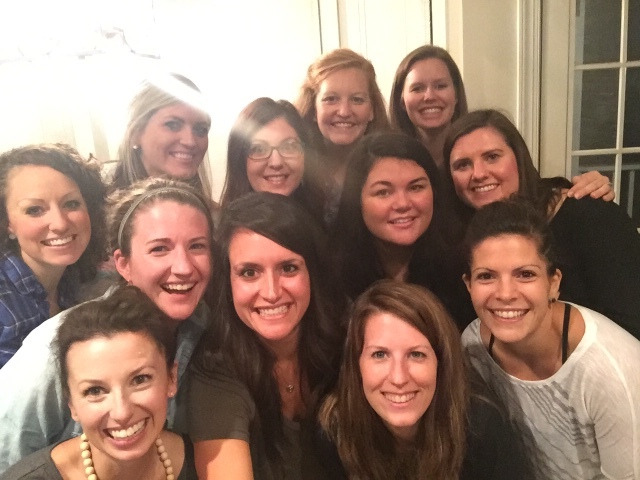 Group text invitations are my new Evite! We always get together at 7:30 so that we have a chance to put kids to bed and then head out the door. This also allows anyone to eat an earlier dinner if they'd like so that the Bunko host just has some apps, and -- well, of course wine. 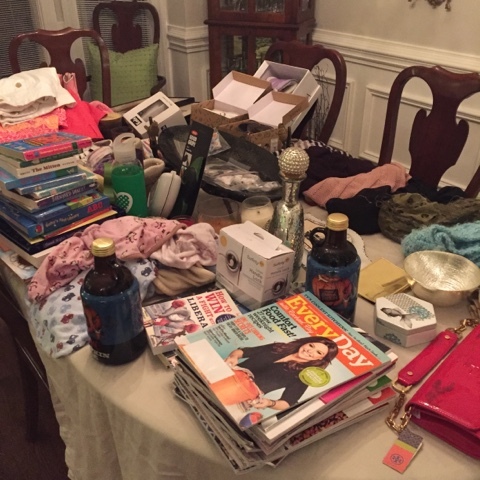 So, everyone came in the door, put their "junk" on my dining room table, and then we all shopped! 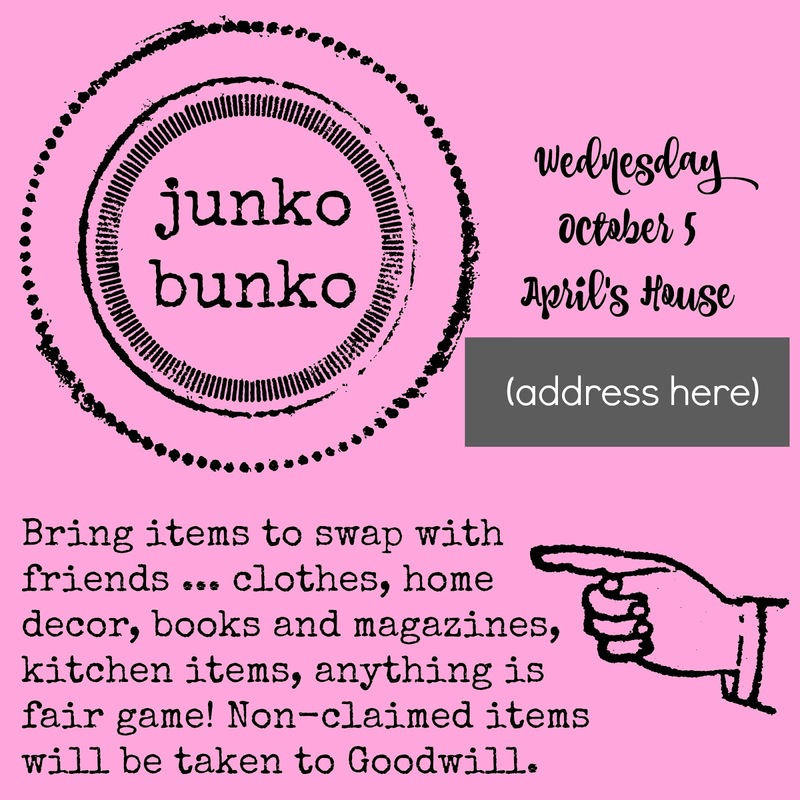 Everything was still GOOD stuff (we use the term "junk" very loosely), just items that we no longer needed and could be rehomed. 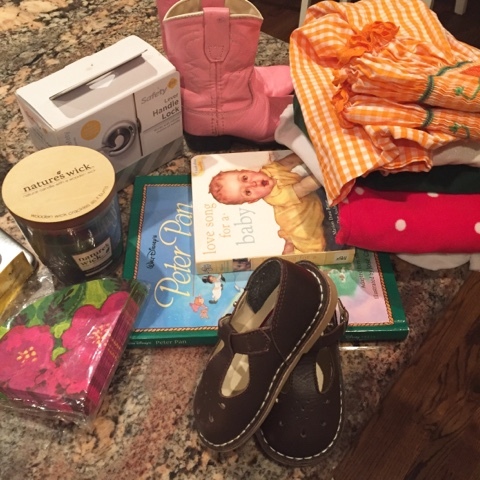 I ended up with some awesome goodies -- check out the pink cowboy boots below for Camille! I am absolutely dying for her to wake up this morning so I can give them to her! And I also have about two or three bins of non-claimed items that I am dropping off at Goodwill. So, everyone wins! I didn't photograph the food, but I made pigs in a blanket, cheese-stuffed peppers (blogged this recipe here), and I also had cinnamon graham crackers drizzled with caramel apple flavored candy melts. Simple. I popped buttery popcorn and had it on each bunko table -- we played outdoors since the weather was so lovely. If you're looking to start a bunko group, here's a set on Amazon. We also start off each get-together by playing a round of Left Right Center (I won last night!!) and you can find that on Amazon here. Thank you for hosting!!! So fun as usual! What a great idea! 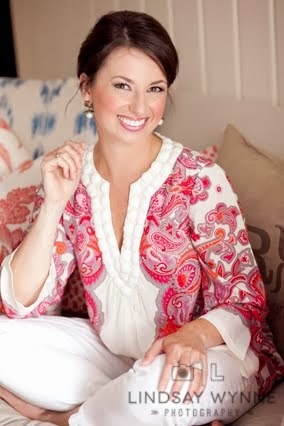 And a great find on the cowboy boots and that smocked dress I spy in the corner. Ok now that is some great junk!! well hello what a fun idea! i love this! What a great idea!!! 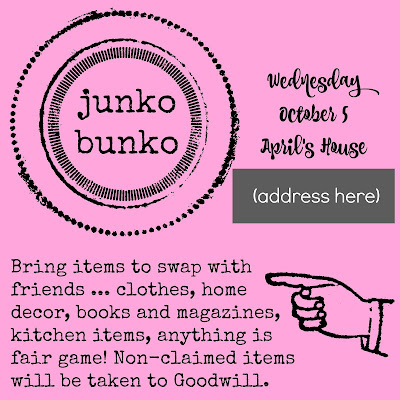 We all have "junk" that would be as good as new to someone else! How fun!! Love this idea!! Thanks again for hosting!!! I had a BLAST!!! Next time I need to get there earlier to shop properly!!! So much fun! Glad you came up with this great idea!! Okay the graham crackers were my fave- I didn't realize that was caramel apple candy melts drizzled on top!